In my last post, I wrote on motivations in our lives. Specifically, is it extrinsic or intrinsic motivation that drives us. Today’s blog post is inspired by the two questions that we constantly ask ourselves, a. ‘What is life’ b. ‘ What is it we want out of our life’ and how these two beautifully connects to our motivations in our lives. Or more precisely,’ what are our life goals’? So, what is Life? Have you observed that every time you ask this question to yourself, you get different answer/s to it. Or for that matter, what is it we want out of our life? I often used to wonder, if there is a way or a road map that can help us to answer these questions and take actionable steps to get the best out of our lives. 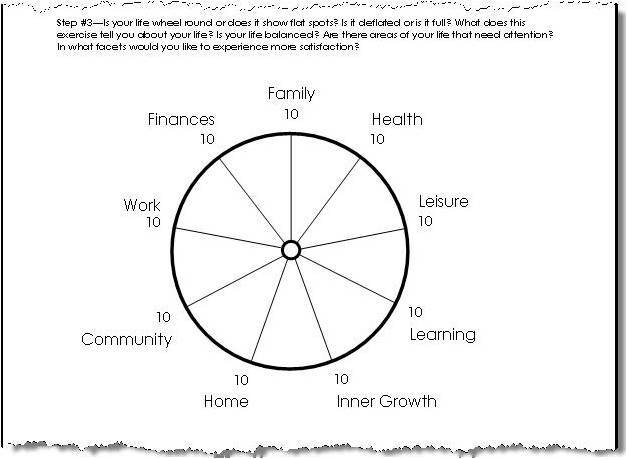 Two years ago, when I was lucky to attend a course on ‘Financial Life Planning’ conducted by Money Quotient, Inc, U.S., I fell in love with this simple yet brilliant tool called ‘Wheel of Life’! Why? Because, this is a Compass which can guide us and help us find directions in Life. I had a great experience doing this fabulous exercise and when I look back today I have made significant progress and feel happy about my life! Our clients enjoy doing and talking about it! I would love to have you try it out. Are you ready? It will take about 5-7 minutes. This exercise is about your current feelings towards life. Hence you should be able to complete it quickly. Imagine you are at the hub or the center of the wheel of life in the picture. And the wheel has nine spokes or covers nine aspects of your life. Now close your eyes and open slowly to focus on one aspect of the life in the wheel. Say let us start with Family. On a scale of 0 to 10, how satisfied are you with your family members and accordingly fill the family spoke with a dot to indicate the rating scale number. Licensed Copyright Material from Money Quotient, Inc.
Close your eyes again and open slowly to focus on Health. On a scale of 0 to 10, how satisfied are you with your Health and accordingly fill the health spoke with a dot to indicate the rating scale number. Repeat this exercise till you complete all the 9 spokes or aspects of your life and connect the dots. Meditate for few moments. Now, tell me how does it feel? Have you ever thought about Life like this before? What does your Wheel of Life tell about you? What aspects of your Life do you feel great about? I mean, the ones where you have scored 7, 8, 9 or even 10? Why do you feel great about it? What took you to get there? Similarly, what aspects of Life that you feel that you will need to work on? Say, the ones you scored 2, 3 or 4 . Do you recollect few of these that you might have scored higher earlier in your life? How did you do it? Finally, if you were to pick up few aspects of your life that you will want to focus now and for the next few years what will it be? Have you identified 2 or 3 steps to move those to a higher score. Say, if your Leisure score is 5 what are the steps that you will take to move it to 7? Think and reflect on it for few minutes. Now go fill up your Vision Board with your Life Goals! And check your motivation in Life. Does it connect? You should be able to live the life you want to be. Because you created it! Go for it! P.S. : Wheel of Life is a tool to review as to where you are now, where do you want to go and how to do you want to get there. It is a compass to measure your Life Balance. The shape of the connected dots may vary for each individual due to various factors or stages in life . For example, some of you may find that Community and Inner Growth scores are low in your satisfaction level or not applicable and you may not want to pursue at this point of time. Also, the motivation factors in life for some of you can be both extrinsic and intrinsic. The purpose of the exercise is to find focus or directions in your life. It is ideal that you set incremental goals initially before you set audacious goals to achieve it. You can re-visit once a year to review your progress and re-focus your life goals. 0 responses on "What are your Life Goals?"